In the olden days, people formed in a group or team when they had the same interest. For instance, if a person had lived in Shannon for a very long time and a new person had just moved to Shannon and they had the same interests, they would form a group. This is what happened with the forming our Shannon Rugby Club. Rugby is a major sport in New Zealand and it started in Shannon, in 1893. There were teams from Otaki and Levin. In the early days our teams played rugby on Stuckey’s Paddock in Levin and on George Woods property in Shannon. 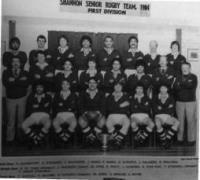 The Shannon Rugby Club was formed in 1899 and is one of the oldest in the Horowhenua Rugby Union. In 1912 our teams travelled to games mainly by train or by coach to Foxton. Teams were often delayed by floods on the Foxton route. The Shannon R.E.C was an amateur athletic association which they competed in high jump,cycling,long jump,running,shot put,discuss,for a name in the news paper. At the REC there was no skate park. It was just all grass. When Mr Law was talking he said that the rugby club was good and that there used to be a building on the domain. In the 1940s the sports club was used mostly for rugby. Mr Law said he used to play rugby himself. The Shannon Rugby Club was one of the first to be formed in New Zealand. The first Shannon Club Rooms were burnt down and later rebuilt into new club rooms with toilets, a kitchen and a bar. We would like to thank Koro Aaron Te Peeti for letting us interview him. We also want to thank our community that shared their stories and information with us. Team effort by Temiana (Year 6) and Brad-Lee (Year 5). All Black Player Jack Griffiths in 1966.
and he replied “ Well everyone in the community does. e.g raffles, Pub charities, stock raising and running events. Part of the reason Shannon Rugby Club is how it is now is because of the tremendous support it receives from the community and with farmers donating meat and other bits really helps. “We’ve got a history of being very well run and we need to be, otherwise we wouldn’t exist,” says club legend John Williams. In the 1992 season Shannon enjoyed winning a 32 winning streak. The Shannon Rugby Club was the first in the area to have their own scoreboard and clock. The Shannon Rugby Club rooms were also built in 1966. In 1965 the old sports pavilion was demolished and Shannon Rugby Club was erected on site. I have enjoyed this experience which is learning about the Shannon Rugby Club this year for the Shannon heritage.